If you have something to teach/share/practise our spaces are versatile and adaptable. Clean, warm and fresh. The Sage and Lotus Space's have large empty walls for projecting as well as  whiteboards. To put it in perspective The Lotus Space can fit max 12 yoga mats, comfortable 8. Perfect for small intimate groups . The Oak and Pod rooms are equipped with treatment tables, desk and chairs. There are chairs and tables for small groups of 20 approx. Plus small kitchen and a communal space for relaxing with a cuppa. We have created a unique member facing website especially for practitioners that use The HolistiCentre. Designed to provide useful information and take care of some admin for you. Real time online room booking system. Marketing made easy! - Downloadable leaflets containing directions. You can add you own logo and session details. In the main mansion house there is a restaurant open from 8 till late. There are extensive grounds for walking/golfing and cosy gardens for contemplation. 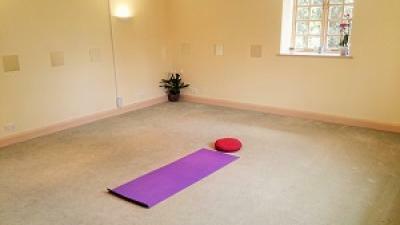 The HolistiCentre is also available to hire as a whole. How could YOU fill the space?